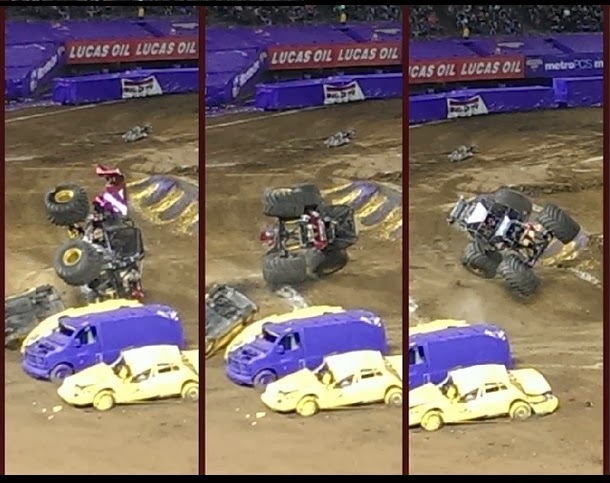 Last weekend we took the kids to see Monster Jam at Oakland's O.Co Coliseum. This was Alfie and the kids' second time to see the show; the first time was about five years ago in Reno. I opted to stay in the hotel and catch up on a few hours of Me Time, so before this weekend, I truly didn't understand what all the fuss was about. When Feld Entertainment sent us the invitation, all the kids -- yes, and Alfie -- screamed in excitement; even my girly 12 year-old Pea was excited. I was looking forward to spending time with the family, of course, but monster trucks aren't really my thing, and I expected to spend most of my time staring at my phone, skimming Facebook and Instagram. Boy, was I wrong. I was pretty much glued to my seat for the entire event! It's hard to look away from the sight of giant trucks with wheels taller than grown men, racing each other on dirt tracks, driving over old cars, flying off hills like ski jumpers, trying desperately to stay upright. It's like a circus act that never gets old, because each truck is different and each driver drives differently and does different tricks. 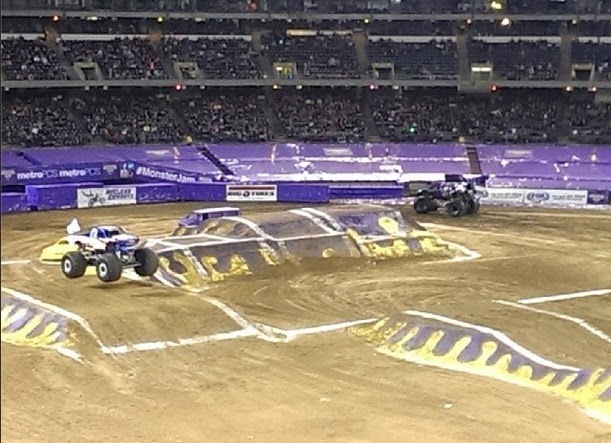 The first part of the show consisted of Monster Jam trucks racing each other in pairs. The losers were eliminated and the winners moved on to quarterfinals, semifinals, and the big final (the winner qualified for the Monster Jam finals in Las Vegas). The second part of the show was a freestyle competition where Monster Jam trucks had 90 seconds (plus an additional 30 seconds for bonus points) to go around the track and impress the judges (and viewers) with leaps, spins, and bounds. It's amazing what the drivers can make their trucks do. Imagine the tricks that BMX bikers can do -- but imagine a ten thousand pound truck doing it. Yes, they even did some flips, which were probably accidental, but the crowd absolutely roared whenever a truck would flip or tip over. They roared even louder when the truck managed to get upright again! The drivers are absolutely crazy (although I'm sure they're actually highly capable stuntmen). They really pushed themselves and their trucks to the limit -- sometimes to the point of shaving the whole side off a truck! The O.Co Coliseum is an outdoor venue, but it was still extremely loud! I'm sure I would have been rendered temporarily deaf if Alfie hadn't brought earplugs for the whole family (he rides motorcycles and loves attending races, so he's an old pro at this!). You can buy disposable earplugs in sporting goods stores that will muffle the sound so well that you won't be able to hear the person beside you -- but still allow you to hear the announcer. You could also bring earphones or earbuds. If all else fails, wad up some tissue paper and stuff it in your ear. It's especially important to protect the ears of children! The O.Co Coliseum has a capacity of over 60,000, and it was about 80% full. There are only 10,000 parking spaces, so that's a lot of people looking for parking! The parking lot closed about 1 hour before showtime, leaving many frustrated families (mine included) having to turn around and look for the overflow lots after waiting almost an hour in line for parking. Before you go, check your venue's seating capacity and parking capacity to help you plan your arrival time. I recommend planning to arrive at least an hour before showtime -- you can always grab dinner or join the Pit Party while waiting for the show to start! Don't forget to check public transportation options! If you're going to arrive early anyway, make the most of your time by joining the pre-show Pit Party! Pit Party passes cost just $10 per person at our venue (prices may vary with location so don't quote me on that!) and you get to see the Monster Trucks up close. You can take photos with the trucks and the drivers, wander around, soak up the atmosphere, and get the whole family revved up for the main event! Disclosure: : I am a Feld Family Ambassador, and in exchange for my time and efforts in attending shows and reporting my opinion within this blog, as well as keeping you advised of the latest discount offers, Feld Entertainment has provided me with complimentary tickets to Feld shows and opportunities to attend private Feld pre-Show events. Show information (in italics) is provided by Feld Entertainment. The views and opinions expressed here are my own.